Many people ask me about the current state of solar energy and its potential. I usually point them to this talk by Stanford lecturer and clean energy entrepreneur, Tony Seba. This entry was posted in Uncategorized on December 24, 2018 by SolarAcademy. RACI – Who owns what? I have worked in big companies with 500, 1000, 10000+ employees. And I worked at small companies with less than 80 employees. I also founded and co-founded 2 companies from scratch and grew one to 25 employees before selling it, and helped grow the other to 70+ and am still involved in running it. In all of these companies, company culture dictated how decision are made. As a leading solar equipment distributor for the independent contractors in the US market, we interact with all kinds of entrepreneurial businesses from focused solar installers with 100+ employees to small contractor family businesses to the one man and a truck operation. No matter what your culture is like, whether it is a cut throat highly structured clear hierarchy, or a more collegial family business, to run an efficient business all teammates need to know who owns which decision. We see that in our own business, our competitors and our successful customers. Those who have this concept nailed down have happier customers and more profitable businesses. I like the concept of RACI when it comes to clarifying who owns what. I became aware of Maynard Webb recently through a former colleague who works closely with him. Maynard is currently a board member at VISA and Salesforce, and was the former Chairman of Yahoo and COO at Ebay. He is also the co-founder and board member of Everwise, a talent development startup. After watching a couple of his interviews on Youtube (here and here) and reading his book, I became a fan of Maynard Webb. I highly recommend his book “Dear Founder“. You can learn more about Maynard Webb here, on his website. This entry was posted in Uncategorized on December 23, 2018 by SolarAcademy. 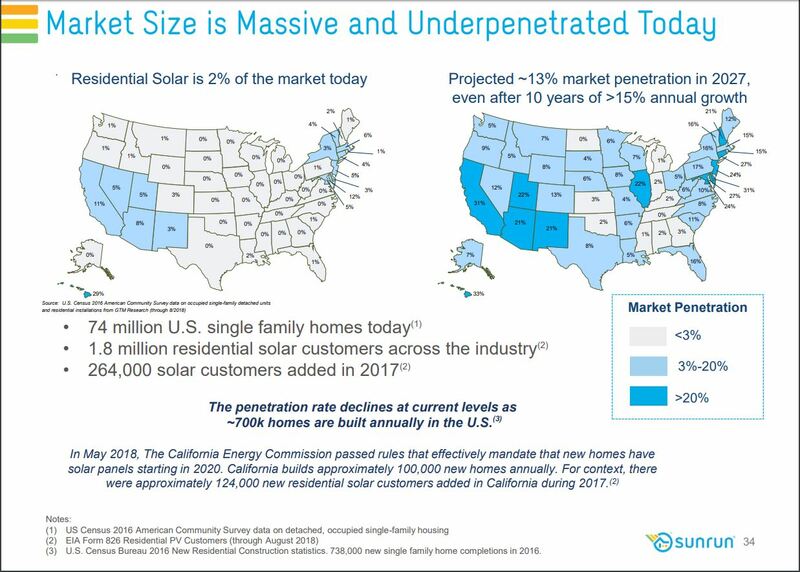 This graphic from Sunrun’s latest quarterly investor presentation (dated Dec 2018, slide 34) shows the current and 2027 expected solar rooftop penetration of each state. This entry was posted in Uncategorized on December 21, 2018 by SolarAcademy. If you can’t solve a problem, enlarge it! “If you can’t solve a problem, enlarge it.” said Dwight Eisenhover. All companies solve a problem one way or another. Sometimes widening the scope of the problem you are solving makes more sense for the world to understand what are doing. This helps attract capital, bright people, and better and more aligned business partners. For example, talking in the context of our company, CivicSolar, we can simply describe our business as a solar equipment wholesaler and distributor, or as a knowledge and equipment distribution platform provider and services aggregator, which accelerates the healing of the planet from the unhealthy and unsustainable state that it finds itself in. I like the latter description better. We, the passionate and purposeful team of people at CivicSolar, are uniquely positioned to help this healing process. – Clean and sustainable energy. Two thirds of the carbon in the atmosphere is due to buildings and vehicles, most of which run on fossil fuels. Solar power will change that dramatically over the next couple of decades. At CivicSolar, we currently operate a web-based sales and marketing platform that serves 1,000s of US-based contractors. We work with the worlds leading solar energy equipment manufacturers to learn everything about their innovative products and pass on our knowledge while selling equipment to contractors. In progressing towards this future, we will try to provide as much free information as our business model allows. We believe in sharing as much information as we can so we can equalize the unequal power distribution not only in the context of dirty fossil fuels but also in the knowledge economy. This entry was posted in Uncategorized on December 20, 2018 by SolarAcademy. I first heard of Hello Tomorrow about 2 years ago when they invited me to talk at their Future of Energy event that was held in Istanbul, Turkey. Hello Tomorrow is a non-profit organization that brings together a community of actors aiming to unlock the potential of deep technologies to solve the world’s toughest challenges. They organize startup competitions, mentorship programs and a series of events around the world, as well as educating and consulting relevant stakeholders on emergence of deep technologies. Hello Tomorrow is fast becoming a key reference platform in deeptech innovation and entrepreneurship. At that 2016 Hello Tomorrow event, I delivered a talk about what we do at CivicSolar and the future of Solar and Advanced Energy Solutions. I finished my presentation talking about the next frontier of renewable and sustainable energy – specifically batteries. In the last part of my talk, I made a reference to MIT Professor Don Sadoway’s 2012 TED Talk titled The missing link to renewable energy. I talked about how fast the cost of solar panels came down in the last 10 years. And I talked about how hard the industry is working on bringing the cost of batteries down, too. I predicted that when the cost of batteries will go down by 5x, in the next decade or two, everything will be different. Before I accepted to talk at the Hello Tomorrow event, I asked them one thing. “Are you going to record and publish my talk (a-la-TED style)?” And they did not say a definite yes. I said, “Well, I will do it only if you record it and make it available like TED does their talks.” And then they told me they would do it. I don’t know if I influenced their video policy decisions or not. You might be wondering why am I telling you all this? I am telling this story to make a point about the power of online video content. As I was browsing my Youtube feed on my Apple-TV at home last night (yeah I don’t watch regular cable TV anymore…) I came across this other 2017 Hello Tomorrow Talk by Don Sadoway titled, Unlocking Renewables in which he talks about his company, Ambri. At minute 12 of his talk Don Sadoway talks about how he raised a bunch of capital from Bill Gates. And he follows that by saying he is Canadian (and therefore polite) and that he would never dare go to Bill Gates to ask for capital. So, what happened was, Bill Gates watched Don Sadoway’s online MIT OpenCurseWare video lectures (all 35 of them) on his own and then reached out to Don Sadoway to meet with him and offered to invest in Sadoway’s company before Sadoway even asked for it. Yes, that is the power of online video. If you put it out there, they will come. What I mean is – if you put yourself out there – what you are trying to do for the world, and why – provided that it adds value to your surroundings, it will attract the right resources (customers, investors, employees, partners, fans, and more…). By the way, shortly after my Hello Tomorrow was published, we (CivicSolar) attracted a group of new amazing investors, as well. Watching Don Sadoway’s Hello Tomorrow video made me once again realize the power of authentic content and the power of video. Video is powerful. If a picture is worth a thousand words, a video is worth a million words. They say words are only 7% of communication. Your tone, the energy of behind those words, your body language, facial expressions are the remainder 93%. Of course if you combine that with other graphics, charts, visual communication objects that accompany your message, your message can become even more powerful. That is why video is important. Especially, as a business communication tool. That is why we are launching SolarAcademy today. I intend SolarAcademy to host lots of content (and hopefully much of it in video format) initially on solar and advanced energy technologies. We intend SolarAcademy content to come not only from us (CvicSolar) but also from others in the industry – our vendors’ (leading manufacturers of solar equipment), our customers, financing providers, solar sales and marketing service providers, even our competitors. The mission of SolarAcademy will be to accelerate the healing of our planet by accelerating the flow of knowledge between the various nodes of the solar industry and most importantly to the millions of property owners, users of energy (essentially everyone in the planet, including home owners, commercial and industrial property owners) to accelerate the transition of their buildings (and vehicles) to run on clean energy instead of fossil fuels. Another goal of SolarAcademy will be to encourage the business community to change some habits. Especially about sharing information. SolarAcademy will encourage and reward companies that share more of their knowledge with their customers (and each other) in a more efficient way. Along the way, if we can catalyze some activism in slow moving states towards their path to renewable clean energy, that will be a nice bonus! Our goal is to create a more collaborative equitable healthy world economy that fosters and rewards a healthy planet. Pure hard nosed competition is not what necessarily makes the world a better place but information sharing and creative solutions that complement each other do. The more you share the more you will get back. Simple. This entry was posted in Uncategorized on December 19, 2018 by SolarAcademy. If you are a homeowner and are considering solar, how you move forward really depends on who you are. Imagine this: You are your partner just bought a new bookshelf from Etsy. It is being handmade and shipped to your doorstep in a couple weeks. The shelves need to be installed on the wall of your living room. The bookshelf consists of seven shelves and 14 brackets that need to be installed on the wall at the right distance from each other, and perfectly level. Each shelf also came with LED lights that have to be attached to the underside of the shelves in a way that the wiring and the fixture are discrete and out of sight. Going solar is not dissimilar, although it is a lot more complex as a process, with many components and processes. Some homeowners are skilled and inclined enough to take care of the entire process themselves, handling each of the financial, technical and local policy compliance, and even installing the system by themselves. While others could not be bothered with anything other than the savings and just need a reliable solar installer to manage the project on a turnkey basis. Many others fall somewhere in between: they get involved in the process, talk to installers, solar equipment sellers, other homeowners, local building officials, to learn as much as they can about the various components and processes. Here at SolarAcademy, you will find the tools and resources no matter who you are. Being clear about who you are from the get-go will help you navigate this process more effectively. In our next article, we will break down the different processes and components of solar buying to help you understand your gaps in knowledge, and point to resources that will fill those gaps. This entry was posted in Uncategorized on May 8, 2018 by SolarAcademy. Buildings are valued based on a Cap rate calculation, which essentially says something like this: If a building’s operating income is $50k, you apply a cap rate of 16-20X to that, which brings the value of the building to $800k-$1M. If you improve the operating income of that building by say $5k per year by installing a solar system that costs you $20-25k (a 4-5 year payback is very common in many areas in the US today) then the value of the building is going to increase by $80-100k. That is how a $20k investment in solar will instantly create a $100k value for a building owner. Of course, this above example will not work out in areas that have super cheap electricity rates or where where cap rates are higher (or where the multiples are lower). In areas where the electricity rate is above 20 cents per kwh, it is very likely to reach this level of a return.